“All I got to do is pass this test, you don’t teach me much but that’s ok, I’ll learn what I need another day,” sing the children. And so begins the story of Brian Malone’s search to find what’s going on in education in the US. It begins with a school board election in Colorado and ends with a searching examination of the corporate takeover of public education. Malone’s story takes off when his kids’ school board is captured by freemarket billionaire reformers who spend a $1-m to gain control of the management and finances of the school. He wanted to know why a group of wealthy businesspeople would spend $1m on an election campaign to get control of a school board. In search of answers, he went to Chicago and then on to Washington DC where we see how the corporate market has managed to get its fingers into the multi-billion dollar public education purse. In Malone’s home school district, Douglas County, around $500,000,000 has been earmarked for public education – that’s an enticing sum of taxpayer money that had in previous times been out of reach of the private sector. But just how does big business get its hands on public education money? As one investment analyst put it, investing in charter school real estate is a great bet. It is the most recession-resistant, highest growth and most appealing of portfolio investments. It’s, as he says, a $2.5-billion annual opportunity. In Malone’s documentary, we see the effects of the reforms in Chicago, where poverty and massive inequality has resulted in just 69 percent of students graduating and where many students have parents in prison and gun violence is a way of life. It’s also where former Obama Chief of Staff, now Chicago Mayor Ron Emanuel has been closing down “failing” schools replacing them with charter schools in many cases run by politically connected outside companies. To see what underpins the policy, you have to go back to 2002 and George Bush’s “No Child Left Behind” policy. This policy ties education success to high stakes standardised testing, with tests produced by multi billion dollar publishing giants such as Pearsons. Teachers are blamed for “student under-achievement” and schools that don’t do well in those standardised high stakes tests, such as schools in poorer areas, are penalised financially. “Failing” schools are then closed down to be replaced by privately-run charter schools. And of course, many of those charter schools have found a way of ensuring the difficult to educate children don’t find a place – things like requiring parents to become “investors” and counselling out and discouraging the enrolment of special needs children. Malone’s journey is a sobering account of how far big corporate interests have infiltrated into every aspect of education in the US and how the model exacerbates inequality and differences of opportunity. It should also ring warning bells in New Zealand where we now hear some strikingly similar rhetoric – the need for a “world-class education system”, how we must stop our slide down the PISA ratings and so on. This documentary is a must-see for all those interested in education. It shows the destination of where the GERM (Global Education Reform Movement Agenda) may be taking us. Gripping documentary about the American public education system. “A must-see,” says best-selling author and education professor Diane Ravitch. 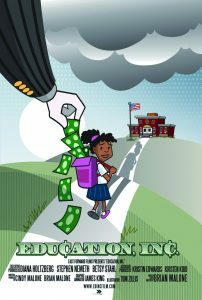 Education, Inc. is told through the eyes of parent and filmmaker Brian Malone, as he travels cross-country in search of the answers and sources behind the privatising of American public education, and what it means for his kids. With striking footage from school protests, raucous school board meetings and interviews with some of the most well known educators in the country, Malone zooms out to paint a clear picture of profit and politics that’s sweeping the nation.